By Jimmy Jividen; Gospel Advocate Company, Nashville, Tenn., 1990; 146 pages, $9.99 paperback. I find myself in an awkward situation. 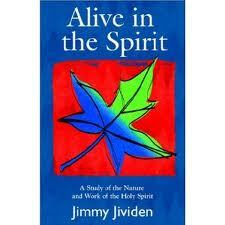 Some months ago I was reading blurbs from Jimmy Jividen’s book Alive in the Spirit: A Study of the Nature and Work of the Holy Spirit as they were appearing online daily, part of the Twitter stream from the Gospel Advocate Company, which I follow. I took this blurb activity to mean that the book was a new offering. I obtained a copy from Gospel Advocate. It took me some months to get around to reading the book, but at length I did. And then I undertook to write this review. In making my notations of publisher/city/state/copyright date, etc., as I did above, I learned to my surprise that the book was not a new book at all, but rather 21 years old! Well, it was my own error for thinking so. I should not have made assumptions. Just the same, I felt some ambivalence in proceeding in this endeavor. But the fact is that I have put in my time reading the book. Further, I promised you, the readers of Something Solid, that a review of this book was forthcoming. And of course the book is still in stock with Gospel Advocate, so it is a viable product. The upshot is that I have now “reviewed” a book that’s older than some of my readers. Interesting, the perspective afforded by two decades’ distancing from the publication of the book casts a revealing light, not just on the book itself, but on the times in which it was written, and our own times as well. More of that shortly. For now, an assessment of the book itself. I find myself in far greater agreement with Jividen than disagreement. Jividen, who was an evangelist within the church of Christ for more than six decades, served as pulpit minister of the Oldham Lane congregation in Abilene, Texas, when it opened in 1996 and remained with that congregation in that capacity until his full-time duties ended a few years ago. Prudent remarks, these. There were—and are—controversies and opposing viewpoints that Jividen neither discusses nor mentions. By steering clear of the theories and polemics surrounding the subject at hand, Jividen leaves himself clear to argue his own cases, without “outside” interference. Was his disclaimer sufficient grounds for justifying this approach? Hard to say. But it happens all the time. And at least he did insert a disclaimer. Some don’t. So if I have criticisms here, those criticisms are directed more at that larger world that still lacks consensus on what the Bible says about the Holy Spirit. And I would say that the largest lingering controversy—and one that I think will occupy Bible scholars more than any other over the next several decades, if not far beyond—is one of context. That is to say, how much of the New Testament’s discussion of the Holy Spirit was meant purely in the context of First Century Christians, and how much was meant for us to apply to ourselves, directly? Let us remember that First Century Christians had in their midst a Holy Spirit who empowered some of them miraculously. And even the most indiscriminate New Testament scholars will admit that the kind of miraculous empowerments known by this first generation of Christians was a kind that passed away when the last of their generation passed away. These questions, I maintain, are not answered by Jividen’s book. Nor by, to my knowledge, anyone else’s single book. They are being explored by various schools of thought—including schools of thought that are, to outward appearances, far removed from one another. So when Jividen discusses the work of the Holy Spirit in the Christian (one of his sub-themes), I find myself wondering… which Christian? The Christian of that New Testament age, or the Christian of today? The Spirit worked differently in each. Some will say that that difference is clearly distinguished. I am not so sure. Others are not so sure. Both issues involved, to greater or lesser degrees, the role of the Holy Spirit in the Christian’s life. The charismatic movement sought to acknowledge more of the “life of the Spirit” in the Christian life. It elevated the idea of being “led by the Spirit” and tended to downplay the alternative as something less-than-ideal, if not downright impoverished. The charismatic movement was hailed by some Christians as a desperately needed revitalization and by others as a succumbing to mysticism, to Pentecostal tendencies within and without, and to erroneous doctrine overall. It was against this backdrop that Jividen brought out his book, and it was in addressing these issues that I feel Alive in the Spirit was and is most needed and most effective. “A perversion of the doctrine of the Holy Spirit is most graphically seen in the way He has been depersonalized by magical claims. “Claiming power from the Holy Spirit, religious leaders offer new revelation, miraculous healings, instant spirituality, and the ability to become healthy, wealthy, and wise. The power comes through the one making the claim. Power, praise, and payment to the priest/prophet/preacher are necessary to claim the blessings of the Holy Spirit. In striking this stance, Jividen appears to be aligned with Hank Hanegraaff, whose book Christianity in Crisis, 21st Century I have reviewed in this same edition of my e-newsletter. Click here to link to that review. Another theme Jividen addresses is the question of the indwelling of the Holy Spirit. Acknowledging that “there has been a lot of discussion about the ‘mode’ of indwelling of the Holy Spirit,” he poses a question. Another question, and one that I feel Jividen argues almost purely from his own perspective (that is, in isolation from competing theories) is the question of the “Gift of the Holy Spirit.” Again, I would have liked to have seen more discussion of opposing viewpoints. As someone else once put it, the question about Acts 2:38 is this: Were those Christians recipients of a gift given by the Holy Spirit, or were they given the Holy Spirit Himself as a gift? Jividen takes the latter position. For a completely different perspective (different than Jividen’s) on that issue, I would refer anyone to a short article by minister Wayne Price of McLoud, Okla. See below for information. I found a more thorough treatment years ago in an article by Price and another minister (Ron Cosby). That article, entitled “The Gift of the Holy Spirit,” was published in a tract, and is still obtainable from Price himself. (I exchanged some emails with Wayne this year and he told me he has copies of the tract and is pleased to make them available to those who are interested.) See below for contact information on Wayne. As for the rest of Alive in the Spirit, I found the book to be sensibly handled and honest in its approach and its views. Some of the charts inserted by Jividen are quite helpful, and would fit well into a classroom presentation. The work belongs in anyone’s bookshelf of commentary on the Holy Spirit—and if that sounds like an extremist’s world (having a shelf of such commentary), then just ask yourself which one book, or mere handful, can do the job satisfactorily. This is a huge topic. I have to applaud this business of looking at the Holy Spirit at all. It is not done so much today. Not as in earlier times. Doctrine in general is not done. But that’s another story. And here is his congregation’s mailing address. I did not ask if there is a charge involved or not, or how much the charge might be.